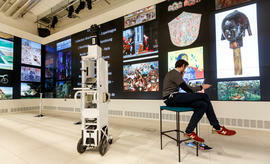 The Google Cultural Institute in Paris features a high-resolution display wall that can show artwork in great detail. In front is one of the camera trolleys used to photograph museums. The Guggenheim Museum’s helical rotunda might just be as famous as the works the museum itself contains. Now you don’t have to go to New York to wend your way around it. Google added 60 museums and cultural institutions to its online Cultural Institute project on Thursday, bringing the total to 1,000. The Guggenheim is among the new additions, as is the world’s heaviest building, the Palace of Parliament in Romania. The Internet may never perfectly replicate the experience of seeing art firsthand or walking the halls of a carefully curated gallery, but many people have no alternative. Either they see it online or not at all. Google isn’t alone in preserving culture and sharing it online. The Commons project at Flickr, Yahoo’s photo-sharing site, just celebrated its eighth anniversary. It hosts thousands of photos from dozens of museums, libraries and other institutions. In the five years since the Google Cultural Institute launched, it’s digitised some of the world’s most famous art collections and taken its Street View cameras inside iconic galleries and museums. Its mission has always been to use new technology to help institutions across the globe open themselves to online audiences that may never otherwise have the chance to step through their doors. Its collection now boasts 6 million objects from 70 different countries. But it goes beyond peeping at high-resolution paintings on your laptop screen. The Institute is currently working to make its cultural experiences even more immersive by adding compatibility for Google Cardboard, the low-cost virtual reality viewer. Cardboard has been a pioneering force in bringing to market virtual reality, an emerging technology that otherwise involves expensive, complex headsets like the upcoming Oculus Rift, HTC Vive and Sony’s PlayStation VR. The technology could end up having multiple applications from gaming to healthcare training to military use. But Mountain View, California-based Google has a few ideas of its own, some of which involve projects it has already invested in, including the Cultural Institute. The company recently partnered with Dulwich Picture Gallery in London to take young patients from King’s College Hospital, also in London, on a “virtual field trip” using Cardboard. “Virtual visits will never replace the real thing,” said Amit Sood, director of the Institute, in a blog post. “But technology can help open up art and culture to everyone, and we think that’s a powerful thing. Another London landmark, Buckingham Palace, also made the jump to virtual reality this week. The official residence of the British monarchy was chosen by thousands of schoolchildren as the place they most wanted to visit on a field trip. It’s now available to view on YouTube in 360 degrees or virtual reality.